On the third day of training camp, the Washington Redskins took part in their first fully-padded practice, with some new drills that weren’t on display the first two days. 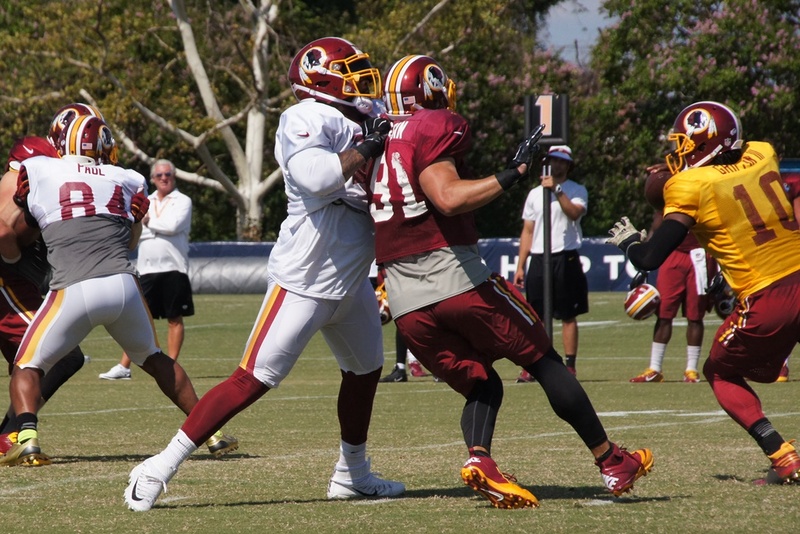 Offensive tackle Trent Williams blocks linebacker Ryan Kerrigan. Photo by Jake Russell. 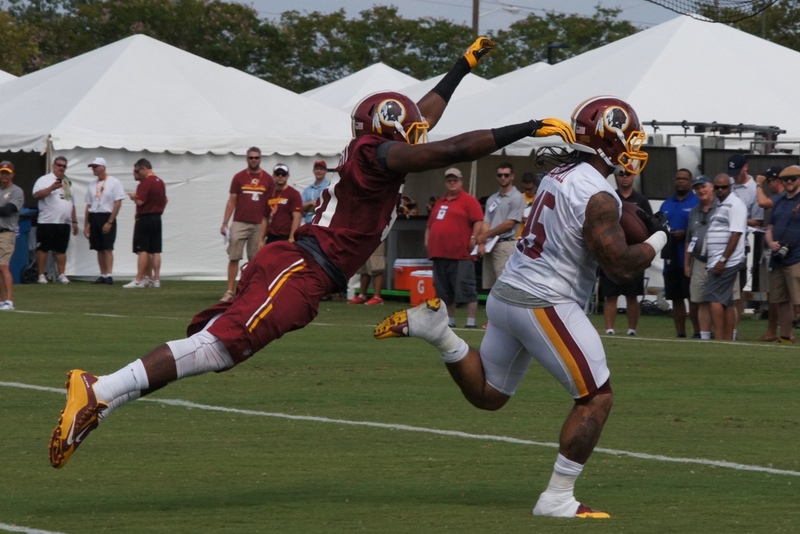 Football is back and the Washington Redskins kicked off their 2015 season in Richmond, Va. for their their third summer at Bon Secours Washington Redskins Training Center. The team switched up their routine this year with walkthroughs in the morning and practices in the afternoon. Enjoy some sights from today’s p.m. practice. Linebacker Martrell Spaight lunges for fullback Jordan Campbell. Photo by Jake Russell. The Washington Redskins needed a change in attitude along the offensive line and they got that in the form of former Iowa Hawkeye road grader Brandon Scherff at fifth overall. Scherff is the fifth offensive lineman selected in the first round in team history. Sixth if you count TCU’s I.B. Hale, a tackle drafted eighth overall in the 1939 NFL Draft. The others tackles taken? Mark May (1981 – 20th overall), Andre Johnson (1996 – 30th overall), Chris Samuels (2000 – 3rd overall) and Trent Williams (2010 – 4th overall). Redskins 2015 free agents: Keep ’em or let ’em go? The Redskins are expected to have 16 players with free agent designations when the new league year begins on March 10. The open negotiation period between free agents and other teams opens on Saturday but deals can’t be signed until Tuesday at 4 p.m. The team will need to make several big decisions. Assuming restricted free agents Kai Forbath, Trenton Robinson and Justin Rogers, and exclusive rights free agents Chris Thompson and Rishaw Johnson all return, the team will be left with 11 unrestricted free agents, meaning they are free to sign anywhere after March 10. Safety Ryan Clark was set to become an unrestricted free agent after signing a one-year deal last year. The 13-year veteran instead opted to retire after a lackluster 2014 season. The team re-signed tackle Tom Compton on February 27, who was slated to become a restricted free agent. Compton played in all 16 games in 2014 and started the final nine games in place of soon-to-be unrestricted free agent Tyler Polumbus. Exclusive rights free agent safety Duke Ihenacho was re-signed on March 4. As an ERFA, the fourth-year veteran would have had to either re-sign with the team or retire. Below is a list of the team’s 11 unrestricted free agents. Early on, the defense, especially Indiana native Ryan Kerrigan, showed they wanted to win this game. A sack-fumble created by Kerrigan that gave the Redskins offense the ball at the Indianapolis Colts’ 15-yard line was followed up with three plays for eight yards resulting in only a field goal. The next Colts drive lasted only four plays when safety Ryan Clark notched his first interception since 2013 and gave the Redskins the ball back at the Colts’ 45-yard line. The offense again put up a dud, mustering only a three-and-out and a punt to the Colts’ 17-yard line. After trailing 21-3, the Redskins put together strong scoring drives to end the first half and begin the second half to cut the Colts lead to 21-17. That was as close as it would get the rest of the game. At the end of the day, Andrew Luck put up a monumental performance by going 19 of 27 for 370 yards, five touchdowns and one interception on the way to a 49-27 drubbing. The loss knocked the Redskins down to 3-9, marking their ninth losing season since 2002. The more things change for the Washington Redskins, the more they stay the same. After the Redskins’ opening offensive resulted in a three-and-out, their defense immediately allowed a quick five-play, 59-yard drive by the San Francisco 49ers. In the first four minutes of the game, a blowout appeared imminent. However, the offense tied the game at seven in the second quarter and the defense only allowed 10 points the rest of the game. The problem was offense, which could only generate two field goals after Alfred Morris’ one-yard touchdown run. After a stellar defensive performance, the Redskins had two opportunities to win in the final minutes of the game but couldn’t come through. The end result? A 17-13 loss and their second 3-8 record in as many seasons. The storyline this week will continue to be Robert Griffin III and his inability to come through in the clutch like he did in his rookie season. They weren’t supposed to win. No chance. No way. Not on primetime. The Dallas Cowboys were fresh off their sixth straight win and two weeks removed from upsetting the reigning Super Bowl Champions on the road. Meanwhile the Redskins barely slid by the hapless Tennessee Titans after turning to third string quarterback Colt McCoy. Oh yeah, and the Redskins are bad during primetime games. Like coming into the game 3-17 in primetime games since 2008 bad. But as the saying goes, that’s why you play the game. Turns out the Redskins had some fight left in them and managed to pull within three games of the NFC East lead, a feat that didn’t seem likely not too long ago. Under the direction of McCoy, a 20-17 overtime victory was in order. A changing of the guard occurred during the Washington Redskins’ 19-17 win over the Tennessee Titans on Sunday when third string quarterback Colt McCoy took over for Kirk Cousins after halftime. Cousins isn’t progressing the way the team would like and head coach Jay Gruden announced on Monday that McCoy will be the team’s starter heading into next Monday night’s showdown against the 6-1 Dallas Cowboys unless Robert Griffin III is 100 percent healthy and ready to go. The Washington Redskins opened up the 2014 season with a new head coach and a new outlook on offense, defense and special teams. That said, it was uncertain what to expect heading into their first game of the year. Fresh off a new six-year, $100 million contract all eyes were on Texans defensive end J.J. Watt, and for good reason. The fourth-year, two-time Pro Bowler played a big role in Houston’s 17-6 victory. His strong defensive effort included three tackles, five quarterback hits, one pass defended, a blocked extra point and fumble recovery. Hopping onto "Sports Talk" on WJLA 24/7 News tonight at 9 p.m. I'll be talking, well, what else -- local sports! Tune in!